Richard John a 52 foot cruiser stern narrowboat, built on a steel shell supplied by Colecraft and providing spacious and comfortable accommodation for four or five people. The fore cabin, with its clear views over the low bow, houses a comfortable dining and lounge area with a settee that converts to a double berth, another settee giving a single berth and a fold-away table. 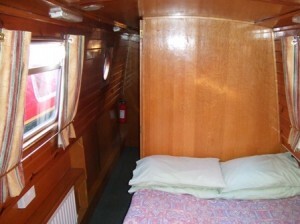 There is a well-equipped galley which features an oven, grill and four burner hob. A roomy fridge with freezer compartment, and spacious cupboards mean meal times are always well catered for. Comfort comes as standard on all Kate Boats, and is maintained on Richard John by central heating throughout. Your bathroom comes complete with bath and shower, wash basin and freshwater flushing toilet. The rear cabin features an additional double berth with comfortable sprung mattress and vanity basin, with storage space provided both underneath the bed and in the large wardrobe. An airing cupboard and locker provide extra room for waterproofs, windlass and mooring stakes.